Saturday September 15, 2018 - It appears that renowned city lawyer, Ahmednassir Abdullahi, has changed his view of President Uhuru Kenyatta and wishes former Prime Minister Raila Odinga would have been the President. This is after he showered Raila with praises as the perfect African statesman, putting aside his personal vendetta against the NASA leader. 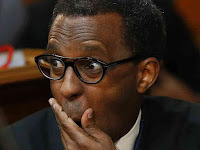 In a rare show of giving credit where it is due, Ahmednasir could not hesitate to recognise Raila's unmatched charisma, and indirectly regretted defending Uhuru/ Ruto at the Supreme Court in 2017 during the Presidential petition that Raila had lodged at the court challenging Uhuru’s win. He shared photos of Raila together with African Presidents and dignitaries when the NASA leader attended the burial of former UN Secretary General, Kofi Annan, in Ghana saying he is the President that Kenya never had. In the photos, Raila is seen exchanging niceties with Ghana's President Nana Akufo-Addo, Ivory Coast's Alassane Ouattara among other prominent dignitaries, which he shared on Twitter. “May the Lord rest the soul of Dr Kofi Annan in eternal peace,” Raila Twitted. “Hon Raila is the quintessential African statesman on the African stage...an icon in his right...” Ahmednassir responded to Raila.